"How Much fun can you cram into a day??" Saint Patrick’s Weekend Tech Day – How Much fun can you cram into a day?? This is one for the books! Tech weekend is over and I can’t believe how much was accomplished in such a short period of time. 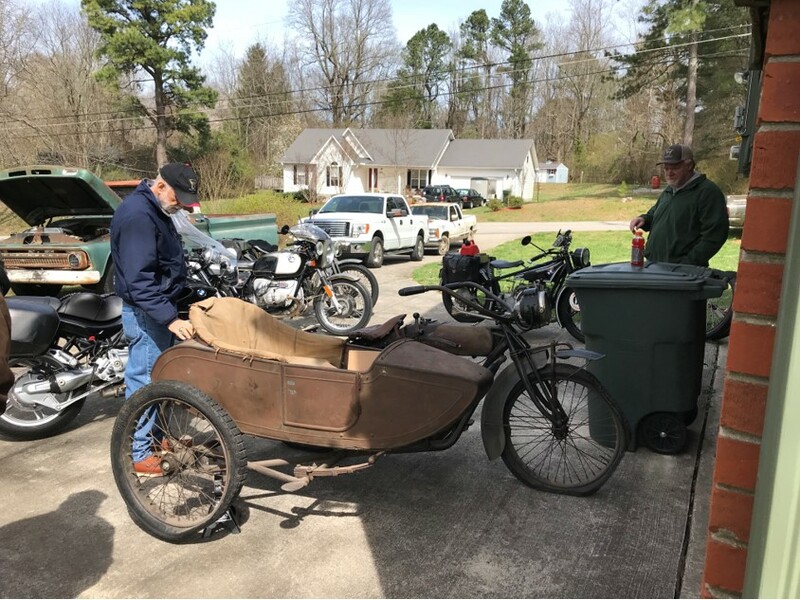 The out of town Smoky Mountain Chapter members started arriving Friday afternoon as we had a Saturday morning 2018 Motorcycle Cannonball presentation to give to the North Alabama Vintage Club at the Blue Plate Café. For those traveling 3 hours or so to get to Huntsville from GA, TN and other locations in Alabama, the 8AM breakfast made leaving on Saturday morning a bit inconvenient. 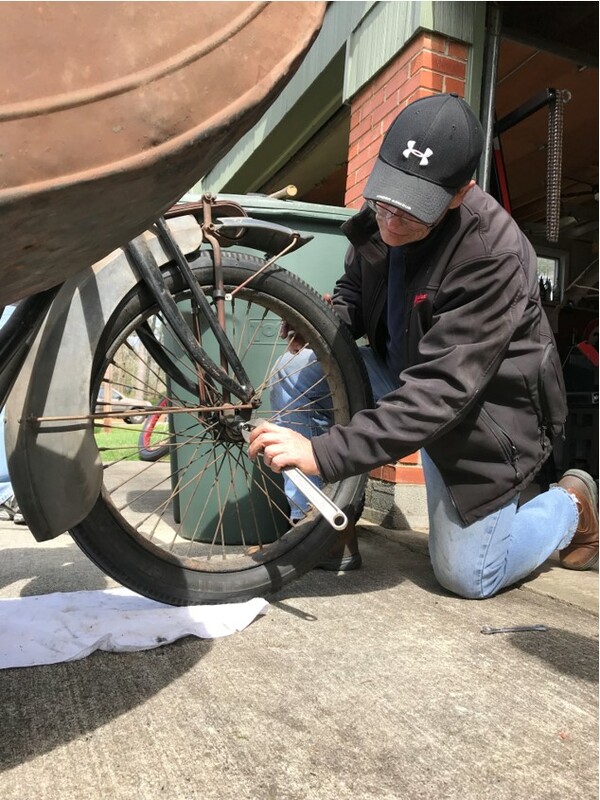 The presentation focused on a support drivers’ life and the spotlight was on 17-year-old Zeke Smith who drove the Ford Transit Van “White Whale” coast to coast across the United States in support of Erik Bahl (#63, 1915 Harley Davidson). It was a packed house with at least 50 people including several guest Smoky Mountain Chapter members. 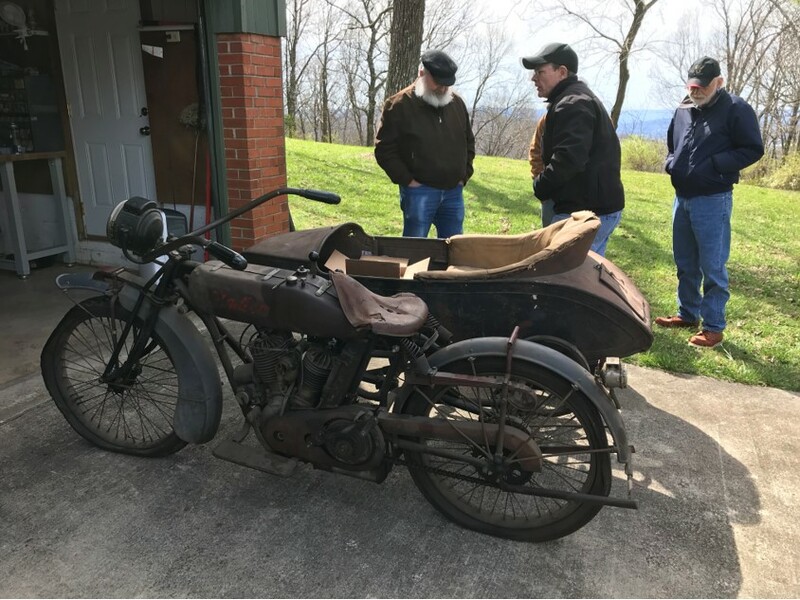 The presentation lasted about 1.5 hours and included an interesting presentation from Smoky Mountain member Doug Jones (#96, 1914 Indian twin) where he discussed the challenges in nursing this delicate piece of machinery from coast to coast. He had a nice display of very expensive failed components to include a head that was destroyed when a valve punched through it when the head separated from the stem. 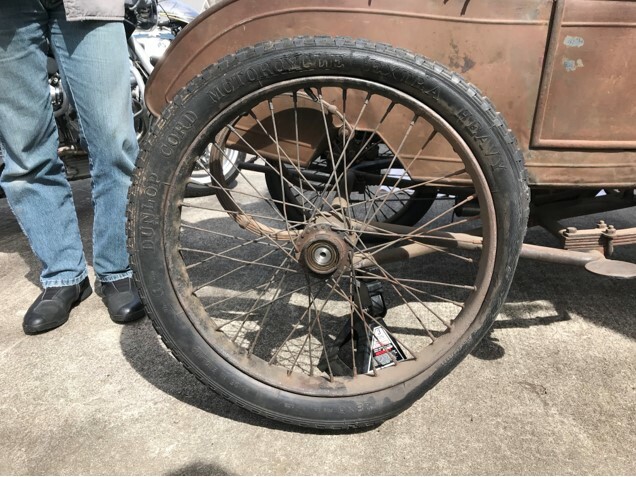 Erik rounded out the discussion with a short presentation on his trek on the 1915 Harley. Afterward the Smoky Mountain Chapter members regrouped at the Bahl compound. 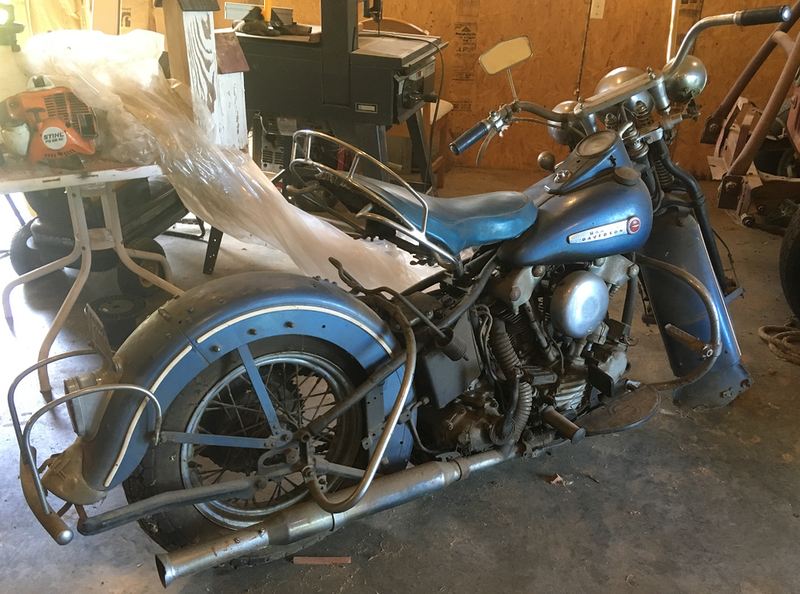 The December tech day activity was removal and disassembly of the transmission from Erik’s 1947 Harley. A lot of work on the transmission has occurred since then and a show and tell of worn and new parts was done. Mike McCloud brought a special lapping tool for the new fourth gear bearing that will properly size the race. This will allow reassembly to begin. 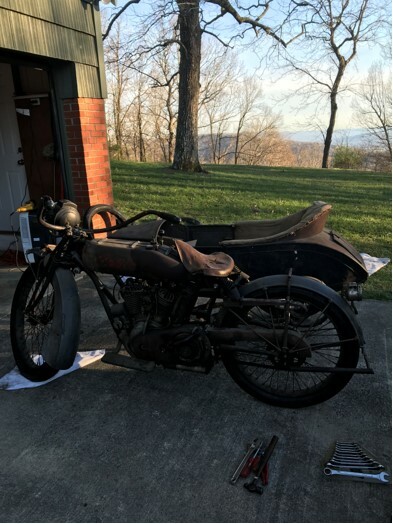 After show and tell Erik’s 1917 Indian Powerplus with sidecar was rolled out into the driveway. It was a bit chilly, but the sun was out. 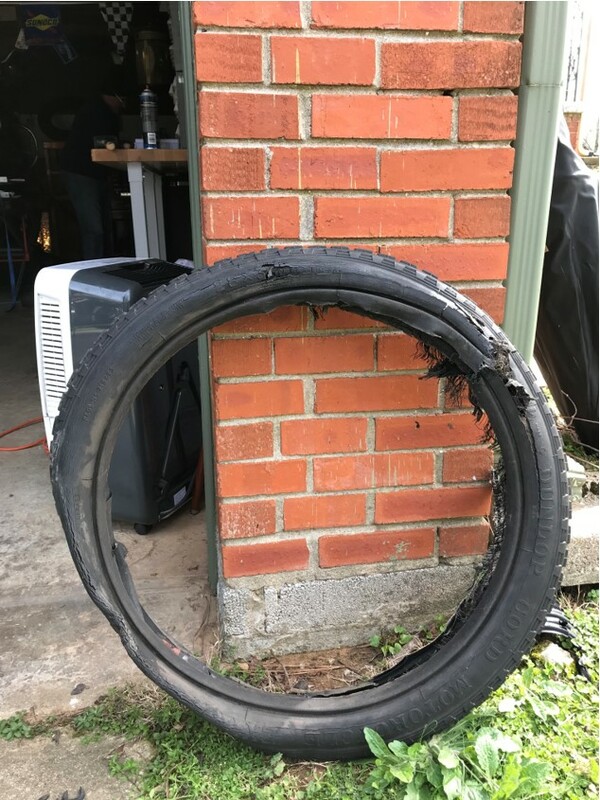 This bike, when purchased had square tires with rubber as hard as a piece of wood. 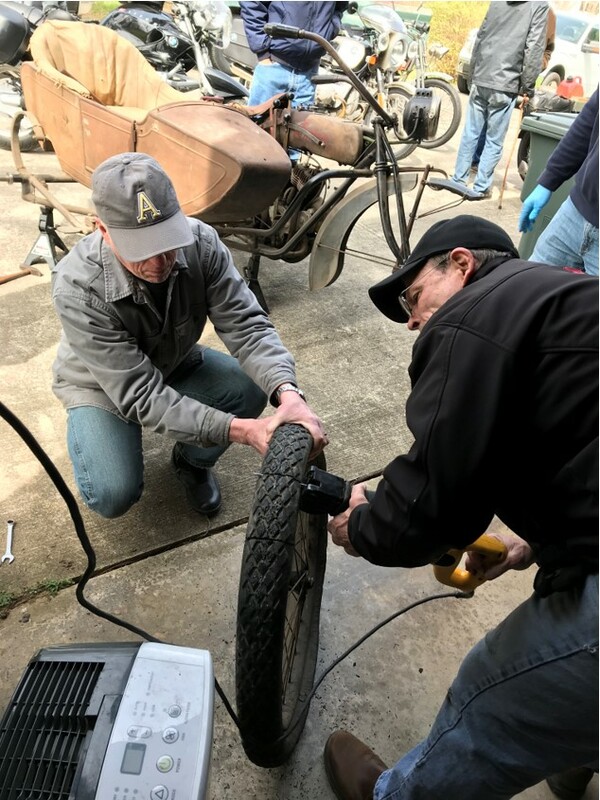 Doug Jones headed up “Clincher Tire School” The wheels were pulled off where one by one the old tires were removed using any means necessary which included a sawzall! Wheel bearings were cleaned and repacked. New tires (provided by Doug) and tubes were installed. Due to the difficultly getting the old tires off, multiple members worked on a single wheel at once. True teamwork! With the front wheel removed we discovered the front forks were loose in the steering head. 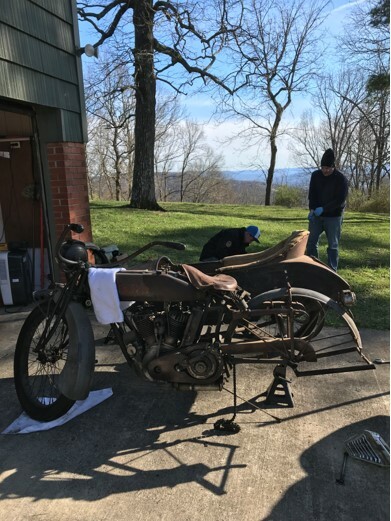 A second group of Smoky Mountain members removed the forks, cleaned and inspected balls, races, regreased and reassembled. In the middle of all this activity we took a late lunch break and headed down to Straight to Ale. It was St. Patty’s and there must have been three hundred people there celebrating. We wrapped up the work about 6:30 PM and chilled out until a late dinner at Ruth’s Chris later that evening (Doug and Patty treated – THANKS!). Shout out goes to first time Huntsville Tech Day participant Wes Connelly (The Ambassador). He showed up with gifts for all! Sunday morning the remaining Smoky Mountain Chapter members had a short class on measuring bearing components with micrometers. 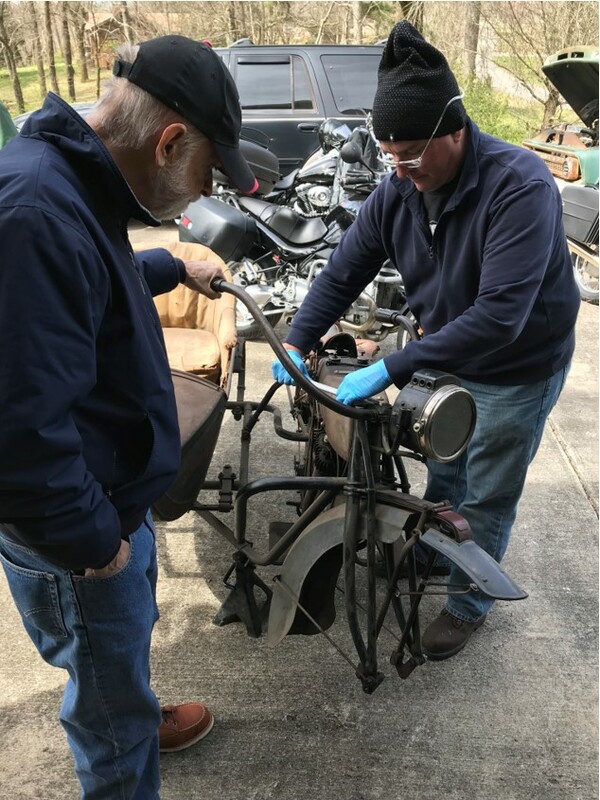 Afterwards Mike McCloud showed us how to setup the lapping tool in the 1947 Harley transmission so the 4th gear race could be sized properly. Now its up to Erik to spend a few hours in his shop cranking the lap to remove the 0.0015” that is required. Thanks to everyone who attended. We had a great time and all experienced a lot of generosity of both time and material items. What a great group of people we have.